At a glance, you know exactly where your packages are! 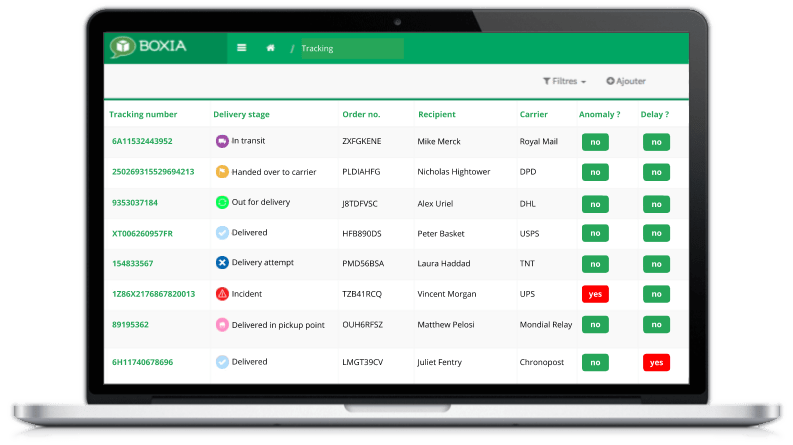 With Boxia, the tracking of all your shipped parcels is centralized on a single platform: you easily know where all your orders are, and you save time when you search for shipping information! You follow in real time the delivery information of all your shipments on a single interface. Your different carriers are supported (UPS, DPD, DHL, TNT, Royal Mail, Chronopost,...) and we continue to integrate more! Boxia is setup in 5 min for websites built on CMS (Prestashop, Magento, ...) and is integrated in a few hours for customized websites (API or FTP).